For semiconductor, hybrid, decorative, protective, wear-resistant and optical applications....MRC offers a full spectrum of equipment for the deposition of thin films. The MRC capabilities include systems for horizontal and vertical sputtering both for R&D, as well as for batch production. The MRC is ideal for high throughput production of semiconductors as well as hybrids and optical devices. With it's typically very high uptime and built-in realiability, the MRC systems are ideal for today's stringent metallization production. Uptime is greatly maximized by simplicity of design, employing solid state technology, fewer moving parts and total automation. The MRC series includes dual level loadlock functionality in order to perform high throughput. MRC's can support up to three Diode and/or Planar Magnetron Cathodes. Loadlocked 3 Target DC Sputtering System with RF Etch with a PC Controller upgrade. 3 DC cathodes 4¾” x 14 7/8” with no shutters, substrates are transported from station to station via chain drive. 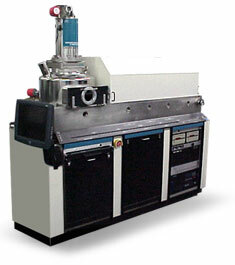 3 Target DC Sputtering System. The 943 comes with heat in etch platform area instead of loadlock area. System has a PC and PLC control system. 3 Cathodes 4-3/4” x 14-7/8” in a sputter down configuration. 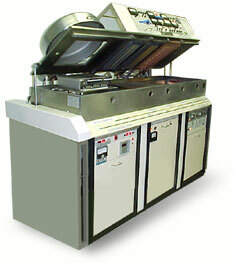 Load-Lock 2 target in-line sputtering system. Holds a 12 inch plate with PLC and touch screen. Come equipped with a 8" CTI Cryo and 1020R air cooled compressor. Runs RF/DC process, substrate heat and etch.